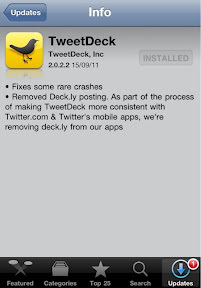 TweetDeck: Goodbye Deck.ly. Hello scheduled updates! Tweetdeck updated its various applications today, and the big news was that the Deck.ly service is dead. It was cool, but it was not a make-or-break feature of TweetDeck. The good news is that Chrome TweetDeck now has SCHEDULED UPDATES! This is a great move, as scheduled updates are my favorite feature of HootSuite (and desktop TweetDeck). So, YAY! Also worth nothing: The announcement that their apps were updated today was the first time TweetDeck has updated its Twitter account since August 2.